...the question undoubtedly is, or soon will be, not whether or no we shall employ notation in chemistry, but whether we shall use a bad and incongruous, or a consistent and regular notation. 'On the Employment of Notation in Chemistry', Journal of the Royal Institution (1838), 1, 438. Cited in Timothy L. Alborn, 'Negotiating Notation: Chemical Symbols and British Society, 1831-1835', Annals of Science (1989), 46, 437. All palaetiological sciences, all speculations which attempt to ascend from the present to the remote past, by the chain of causation, do also, by an inevitable consequence, urge us to look for the beginning of the state of things which we thus contemplate; but in none of these cases have men been able, by the aid of science, to arrive at a beginning which is homogeneous with the known course of events. The first origin of language, of civilization, of law and government, cannot be clearly made out by reasoning and research; and just as little, we may expect, will a knowledge of the origin of the existing and extinct species of plants and animals, be the result of physiological and geological investigation. In History of the Inductive Sciences (1837), Vol. 3, 581. As we cannot use physician for a cultivator of physics, I have called him a physicist. We need very much a name to describe a cultivator of science in general. I should incline to call him a Scientist. Thus we might say, that as an Artist is a Musician, Painter or Poet, a Scientist is a Mathematician, Physicist, or Naturalist. The Philosophy of the Inductive Sciences (1840), Vol. I, cxiii. Astronomy is … the only progressive Science which the ancient world produced. In History of the Inductive Sciences from the Earliest to the Present Times (1837), Vol 1, 90. Astronomy, as the science of cyclical motions, has nothing in common with Geology. But look at Astronomy where she has an analogy with Geology; consider our knowledge of the heavens as a palaetiological science;—as the study of a past condition, from which the present is derived by causes acting in time. Is there no evidence of a beginning, or of a progress? In History of the Inductive Sciences (1857), Vol. 3, 516. But with regard to the material world, we can at least go so far as this;—we can perceive that events are brought about, not by insulated interpositions of Divine power, exerted in each particular ease, but by the establishment of general laws. In Astronomy and General Physics Considered with Reference to Natural Theology (1833), 356. Charles Darwin placed this quote on the title page of his On the Origin of Species, identified as from Whewell's 'Bridgewater Treatise'. Every detection of what is false directs us towards what is true: every trial exhausts some tempting form of error. In 'Lecture 7', Lectures on the History of Moral Philosophy in England (1852), 101. Gold and iron at the present day, as in ancient times, are the rulers of the world; and the great events in the world of mineral art are not the discovery of new substances, but of new and rich localities of old ones. Lecture (26 Npv 1851), to the London Society of Arts, 'The General Bearing of the Great Exhibition on the Progress of Art and Science', collected in Lectures on the Results of the Great Exhibition of 1851' (1852), 3. 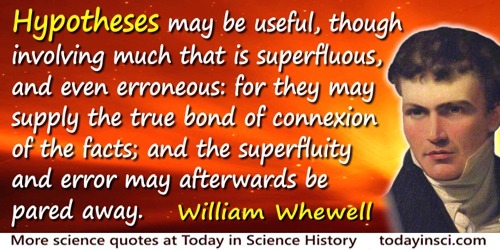 Hypotheses may be useful, though involving much that is superfluous, and even erroneous: for they may supply the true bond of connexion of the facts; and the superfluity and error may afterwards be pared away. Aphorism 11, 'Aphorisms Concerning Science', The Philosophy of the Inductive Sciences (1840), Vol. 1, xxxvi. In order that the facts obtained by observation and experiment may be capable of being used in furtherance of our exact and solid knowledge, they must be apprehended and analysed according to some Conceptions which, applied for this purpose, give distinct and definite results, such as can be steadily taken hold of and reasoned from. Philosophy of the Inductive Sciences (1840), Vol. 2, 205. In this manner the whole substance of our geometry is reduced to the definitions and axioms which we employ in our elementary reasonings; and in like manner we reduce the demonstrative truths of any other science to the definitions and axioms which we there employ. In The Philosophy of the Inductive Sciences: Founded Upon Their History (1840), Vol. 1, 67. In truth, we know causes only by their effects; and in order to learn the nature of the causes which modify the earth, we must study them through all ages of their action, and not select arbitrarily the period in which we live as the standard for all other epochs. In History of the Inductive Sciences (1857), Vol. 3, 514. Aphorism 12, 'Aphorisms Concerning Science', The Philosophy of the Inductive Sciences (1840), Vol. 1, xxxvi. 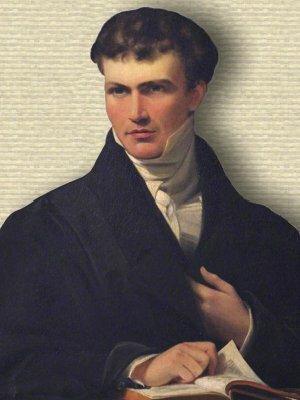 It is a wrong business when the younger cultivators of science put out of sight and deprecate what their predecessors have done; but obviously that is the tendency of Huxley and his friends … It is very true that Huxley was bitter against the Bishop of Oxford, but I was not present at the debate. Perhaps the Bishop was not prudent to venture into a field where no eloquence can supersede the need for precise knowledge. The young naturalists declared themselves in favour of Darwin’s views which tendency I saw already at Leeds two years ago. I am sorry for it, for I reckon Darwin’s book to be an utterly unphilosophical one. Letter to James D, Forbes (24 Jul 1860). Trinity College Cambridge, Whewell Manuscripts. 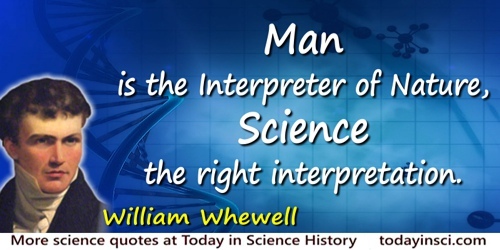 Man is the Interpreter of Nature, Science the right interpretation. Aphorism 1, 'Aphorisms Concerning Ideas', The Philosophy of the Inductive Sciences (1840), Vol. 1, xvii. Newton’s theory is the circle of generalization which includes all the others [as Kepler’s laws, Ptolemy’s theory, etc. ];—the highest point of the inductive ascent;—the catastrophe of the philosophic drama to which Plato had prologized;— the point to which men’s minds had been journeying for two thousand years. In History of the Inductive Sciences, Bk. 7, chap. 2, sect. 5. No discovery is the work of accident. Aphorism 3, 'Aphorisms Concerning Science', The Philosophy of the Inductive Sciences (1840), Vol. 1, xxxvii. Order and regularity are more readily and clearly recognised when exhibited to the eye in a picture than they are when presented to the mind in any other manner. In The Philosophy of the Inductive Sciences: Founded Upon Their History (1840), 543. Scarcely any attempt is entirely a failure; scarcely any theory, the result of steady thought, is altogether false; no tempting form of Error is without some latent charm derived from Truth. 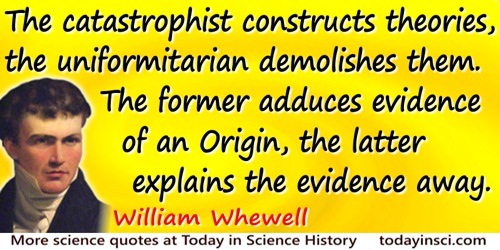 The catastrophist constructs theories, the uniformitarian demolishes them. The former adduces evidence of an Origin, the latter explains the evidence away. Aphorism 110, 'Aphorisms Concerning Ideas', The Philosophy of the Inductive Sciences (1840), Vol. 1, xxxvi. The doctrine that logical reasoning produces no new truths, but only unfolds and brings into view those truths which were, in effect, contained in the first principles of the reasoning, is assented to by almost all who, in modern times, have attended to the science of logic. The ideas which these sciences, Geometry, Theoretical Arithmetic and Algebra involve extend to all objects and changes which we observe in the external world; and hence the consideration of mathematical relations forms a large portion of many of the sciences which treat of the phenomena and laws of external nature, as Astronomy, Optics, and Mechanics. 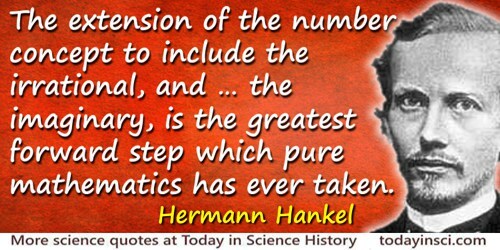 Such sciences are hence often termed Mixed Mathematics, the relations of space and number being, in these branches of knowledge, combined with principles collected from special observation; while Geometry, Algebra, and the like subjects, which involve no result of experience, are called Pure Mathematics. In The Philosophy of the Inductive Sciences (1868), Part 1, Bk. 2, chap. 1, sect. 4. The mystery of creation is not within the range of [Nature’s] legitimate territory; [Nature] says nothing, but she points upwards. In History of the Inductive Sciences (1837), Vol. 3, 588. Aphorism 25, 'Aphorisms Respecting Knowledge', The Philosophy of the Inductive Sciences (1840), Vol. 1, xli. The peculiar character of mathematical truth is, that it is necessarily and inevitably true; and one of the most important lessons which we learn from our mathematical studies is a knowledge that there are such truths, and a familiarity with their form and character. This lesson is not only lost, but read backward, if the student is taught that there is no such difference, and that mathematical truths themselves are learned by experience. In Thoughts on the Study of Mathematics. Principles of English University Education (1838). The persons who have been employed on these problems of applying the properties of matter and the laws of motion to the explanation of the phenomena of the world, and who have brought to them the high and admirable qualities which such an office requires, have justly excited in a very eminent degree the admiration which mankind feels for great intellectual powers. Their names occupy a distinguished place in literary history; and probably there are no scientific reputations of the last century higher, and none more merited, than those earned by great mathematicians who have laboured with such wonderful success in unfolding the mechanism of the heavens; such for instance as D ’Alembert, Clairaut, Euler, Lagrange, Laplace. In Astronomy and General Physics (1833), Bk. 3, chap. 4, 327. 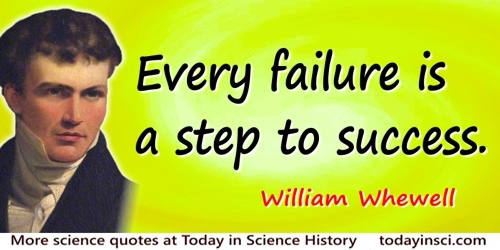 The principles which constituted the triumph of the preceding stages of the science, may appear to be subverted and ejected by the later discoveries, but in fact they are, (so far as they were true), taken up into the subsequent doctrines and included in them. They continue to be an essential part of the science. The earlier truths are not expelled but absorbed, not contradicted but extended; and the history of each science, which may thus appear like a succession of revolutions, is, in reality, a series of developments. In History of the Inductive Sciences (1837) Vol. 1, 10. The results of systematic symbolical reasoning must always express general truths, by their nature; and do not, for their justification, require each of the steps of the process to represent some definite operation upon quantity. The absolute universality of the interpretation of symbols is the fundamental principle of their use. In 'The Foundations of Higher Mathematics', The Philosophy of the Inductive Sciences (1847), Part I, Bk. 2, 149. The two processes by which Science is constructed are the Explication of Conceptions and the Colligation of Facts. Aphorism 1, 'Aphorisms Concerning Science', The Philosophy of the Inductive Sciences (1840), Vol. 1, xxxvii. The use of every organ has been discovered by starting from the assumption that it must have been some use. In History of the Inductive Sciences (1857), Vol. 3, 385. There is a mask of theory over the whole face of nature, if it be theory to infer more than we see. The Philosophy of the Inductive Sciences: Founded Upon Their History (1840), Vol. 1, 24. This science, Geometry, is one of indispensable use and constant reference, for every student of the laws of nature; for the relations of space and number are the alphabet in which those laws are written. But besides the interest and importance of this kind which geometry possesses, it has a great and peculiar value for all who wish to understand the foundations of human knowledge, and the methods by which it is acquired. For the student of geometry acquires, with a degree of insight and clearness which the unmathematical reader can but feebly imagine, a conviction that there are necessary truths, many of them of a very complex and striking character; and that a few of the most simple and self-evident truths which it is possible for the mind of man to apprehend, may, by systematic deduction, lead to the most remote and unexpected results. In The Philosophy of the Inductive Sciences Part 1, Bk. 2, chap. 4, sect. 8 (1868). To discover the laws of operative power in material productions, whether formed by man or brought into being by Nature herself, is the work of a science, and is indeed what we more especially term Science. Lecture (26 Nov 1851), to the London Society of Arts, 'The General Bearing of the Great Exhibition on the Progress of Art and Science', collected in Lectures on the Results of the Great Exhibition of 1851' (1852), 7. In The Elements of Morality (1845), Vol 1, 1. 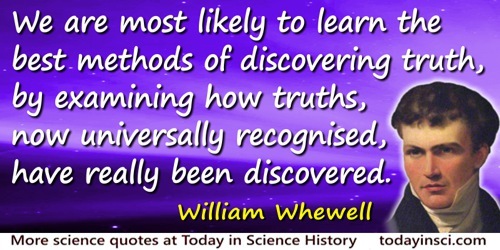 We may best hope to understand the nature and conditions of real knowledge, by studying the nature and conditions of the most certain and stable portions of knowledge which we already possess: and we are most likely to learn the best methods of discovering truth, by examining how truths, now universally recognised, have really been discovered. In The Philosophy of the Inductive Sciences (1840), Vol. I, 3-4. [Astronomy was] the only progressive science produced by the ancient world. [A] theory is a Fact; a Fact is a familiar Theory. In The Philosophy of the Inductive Sciences (1840), Vol. I, 40. 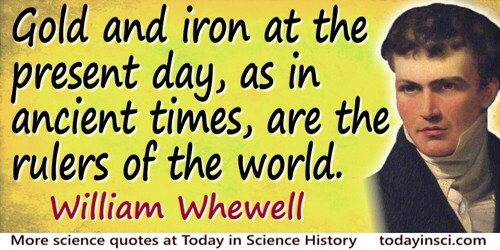 Science is [William Whewell’s] forte and omniscience is his foible. Quoted in J. Todhunter (ed. ), William Whewell: An Account of His Writings With Selections from his Literary and Scientific Correspondence (1876), Vol. 1, 410. 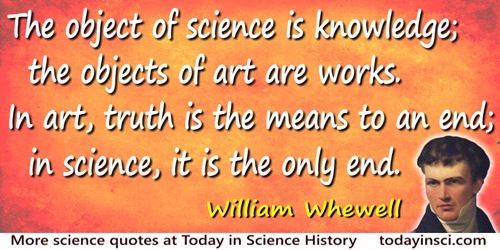 If it is true as Whewell says, that the essence of the triumphs of Science and its progress consists in that it enables us to consider evident and necessary, views which our ancestors held to be unintelligible and were unable to comprehend, then the extension of the number concept to include the irrational, and we will at once add, the imaginary, is the greatest forward step which pure mathematics has ever taken. 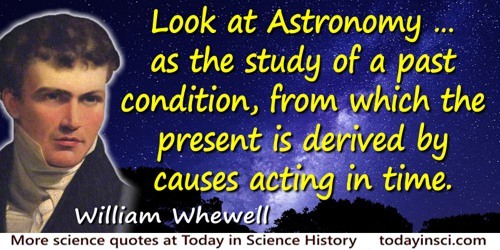 24 May - short biography, births, deaths and events on date of Whewell's birth. 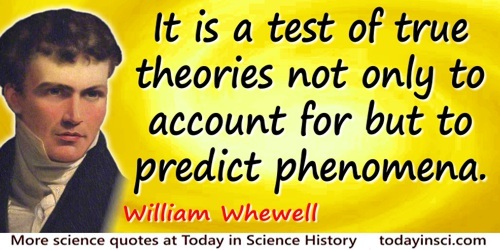 William Whewell: Theory of Scientific Method, by William Whewell. - book suggestion.